Sunset Rubdown at Richard’s, originally uploaded by Mister Wind-Up Bird. 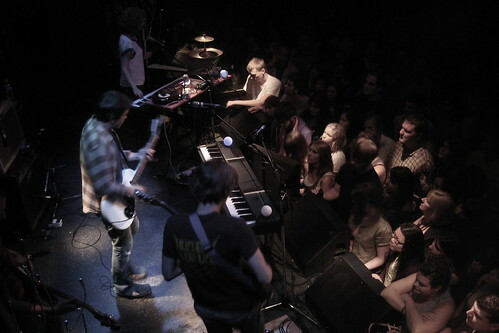 Spencer Krug and company playing to a sold out show at Richard’s on Richards. The opener was a band called Witchies, whom I’ve never heard of, but they were fantastic. Junior Boys at the Biltmore, originally uploaded by Mister Wind-Up Bird. 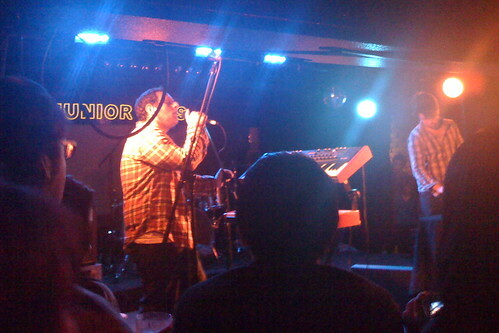 Saw Junior Boys at the Biltmore last night. Maybe it’s just that I haven’t been to a show in a while, but I had a great time. They sounded much more polished than the last time I saw them, and while I haven’t hear the new album yet, all the songs they played off it sound terrific. And the Junior Boys brand of whispery, synth-powered indie-electronica is well-suited to the cramped and sweaty subterranean confines of the Biltmore Cabaret, where the entire audience is within about three meters of the performers. The only real downside of the show is that their audience seems to have gone from introverted electonica nerds to include a lot more annoying cool-dudes and their trendy drunk girlfriends. Such is the price of success. Wolf Parade rocks the Commodore, originally uploaded by Mister Wind-Up Bird. 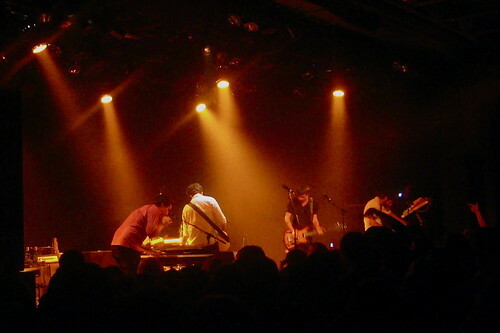 Janelle and I took in Wolf Parade at the Commodore Ballroom last night. I’m not in love with either of Wolf Parade’s full-lengths, but I love individual tracks on each. And after seeing them perform, I think I’d happily pick up a live album. Several tracks I’d given only a cursory listen on my iPod jumped out when I watched them on stage, and they sounded really tight as a band. The only downer was keyboardist-vocalist Spencer Krug passive-aggressively taunting the crowd between tracks — apparently the sight of a sold-out Commodore Ballroom cheering and having a good time wasn’t enough. And people did, indeed, seem to be having a good time, even if Vancouver really does seem to be too insecure to dance at indie neo-prog-rock concerts. 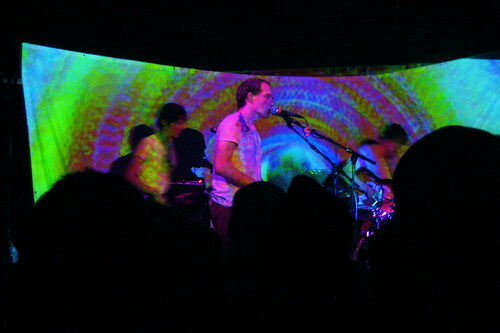 Caribou at Richard’s, originally uploaded by Mister Wind-Up Bird. I’ve been a fan of Caribou for a while, and his/their new album Andorra is one of my two or three favourites of 2007, so I was pretty excited to see Caribou at Richard’s last night (and pretty upset when I thought I lost a ticket, but it turns out it was okay — I’m an idiot and forgot Hendrik had his own). The vintage-and-Converse set was out in force, and Dan Snaith and his band, featuring two drummers, a penny whistle, various guitars and a laptop did not disappoint. As probably befits a guy with a PhD in mathematics, Caribou is much more about delivering a seamless experience of interlocking songs than rock star posing. The show was the band in front of a white sheet, with simple geometric shapes projected on the stage and audience, while they played punched-up live versions of almost all of Andorra, seamlessly integrated with highlights of previous albums, going back to Snaith’s Manitoba years (some of which seem like they might have been Andorra-ized to fit in better with that album’s pop-psychedelica sound, or maybe they always sounded like that, portending the new album). Great show. My roommate (and fellow Caribou fan) Meghan apparently thought so, too (it’s subtle, but you can read between the lines).